Perlanecontains bio-engineered, stabilized, non-immunologic hyaluronic acid gel particles. It is implanted into the deep dermis directly to add volume to the skin and restore surface contours in the target area. The 3D gel particles in Perlane are hydrophilic molecules which attract and bind with the water molecules as they bio-degrade. This helps to maintain skin volume augmentation for a longer period of time. The key difference between Perlane and Restylane is the size of the gel particles. The particle size in Perlane is considerably larger than that of Restylane. Perlane contains a greater quantum of hyaluronic acid. This means that Perlane may be more appropriate for deeper wrinkles and nasolabial folds, while it may also be used to eliminate fine lines in thin skinned patients. In terms of longevity of results, both Perlane and Restylane can produce skin volume that lasts for anywhere between six and nine months. However, the results between both treatments may vary from one individual to another.Perlane is also distinct from other hyaluronic acid based dermal fillers because it is minimally cross linked, which makes it relatively closer to the natural hyaluronic acid found in the human body. Perlane is used to treat moderate to severe creases around the mouth, which is its primary role. However, it may also help to plump eyebrows, smooth the hollows underneath the eyes, enhance the lips, define the curve of the upper lip or the cupid’s bow, define contours of the cheeks by adding volume, and enhance the chin and jaw line. Some dermatologists also prefer to use Perlane to soften the appearance of depressed facial marks and scars. It is the right choice? A number of soft tissue dermal fillers are available today, and it becomes important to choose the one that is most appropriate to a patient’s needs. It helps to have a frank discussion with the dermatologist before deciding on Perlane as the treatment of choice. Experienced doctors will evaluate the patient’s facial structure and understand the aesthetic objectives and expectations before recommending Perlane or other fillers. Perlane is free of animal protein, which means the patient does not have to undergo an allergy test. Patients who are generally sensitive to allergies may prefer Perlane because it contains no animal products. 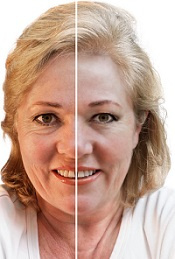 The Perlane procedure can be performed at the dermatologist’s facility on an outpatient basis. It may usually take about half an hour, but the duration may vary based on the extent of the treatment.